Metatarsalgia can be a bit of an umbrella term used to cover any forefoot pain, particularly metatarsal pain. Usually, the term refers to inflammation which occurs in the joints between the metatarsal bones in the foot and phalanges bones of the toes. The pain is normally gradual and makes the bottom of the ball of the foot tender. Symptoms typically consist of pain in the forefoot which is worse during weight bearing, particularly during the middle phase and push off phase of walking when the foot is in contact with the ground. In the early stages, a separation between two toes may be seen and is known as the V sign. Passive flexion or bending of the toe can reproduce pain. There may also be hard skin or calluses under the foot due to excess pressure. A high or rigid arched foot (pes cavus) may increase the likelihood of metatarsalgia by increasing the pressure on the forefoot. Overpronation of the foot is where the foot rolls in or flattens too much during the gait cycle. This will increase pressure on the forefoot making inflammation more likely. 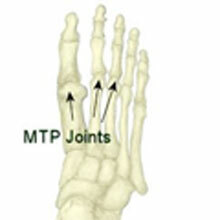 A shortened first metatarsal bone can cause excess pressure to go through the second metatarsal bone. This is known as Morton’s foot. The extensor tendons extend or straighten the toes. If these are tight this can lead to inflammation. Poorly fitting footwear may compress the forefoot or if the athlete laces up shoes too tightly this can also compress the forefoot increasing the likelihood of joint inflammation. Conditions such as hammer toe or bunions. Hammer toe is a condition which causes one or more of the small toes to bend upwards at the joint. A bunion is a deformity or the joint at the base of the big toe. Age – older people are more susceptible and degeneration of the bones is more likely. Stress fractures of the metatarsals. A stress fracture is a hairline fracture which has gradually occurred with overuse. Repetitive high impact such as running or jumping. Arthritis resulting in general wear and tear of the joints in the foot. Diabetes is responsible for a number of foot complications. Morton’s neuroma which is pain caused by compression and inflammation of the nerve between the 3rd and 4th toes. Gout which is a form of arthritis caused by a build up of Uric acid in the joint. Ultimately treatment of metatarsal pain involves providing relief from the pain and identifying and treating any structural or biomechanical causes. NSAID’s such as ibuprofen (nonsteroidal anti-inflammatory drugs) may reduce pain and inflammation. Always speak to your Doctor first. Use padding to protect the foot and re-distribute weight on the metatarsal bones. A Metatarsal lift compression pad which is inserted into the front of the shoe is ideal. Or a gel type shock absorbing and cushioning insoles which have the cushioning material in the forefoot can also provide relief from symptoms. Wearing flat, spacious shoes that do not restrict the forefoot can help as can stretching the calf muscles regularly throughout the day. A doctor or sports injury professional can commission X-rays, MRI’s or Ultrasound scans which can be used to look inside the foot to view any damage, Arthritis or degeneration of the bones. Blood tests may be taken to diagnose any underlying medical causes such as Diabetes or Gout. A podiatrist may assess your foot position and gait walking pattern and If necessary custom orthotics or insoles can be made to correct the movement of the foot. A doctor may inject a corticosteroid injection into the foot. Traction applied longitudinally to the toe can increase the joint space relieving symptoms.